I love maps, and tracking; and ambient tracking where you forget about the fact that you are being tracked until later is great. 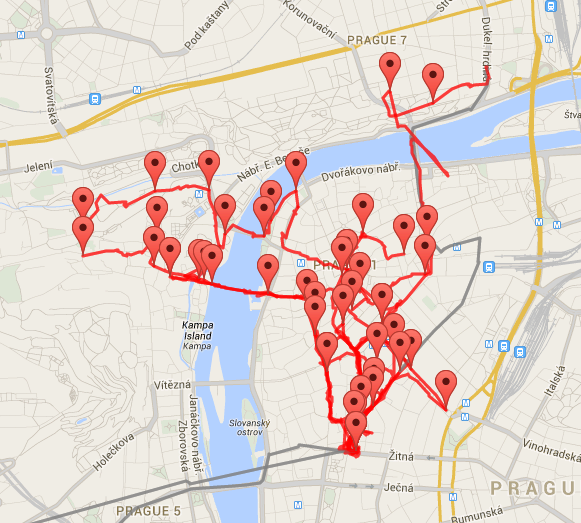 This is the map of everywhere we walked in Prague on a break last October. Data tracked with Moves, I can’t remember the service I used to draw the map and it seems to have vanished since. We stayed in a hotel at the southern tip of all those red lines which show where we walked. The grey lines heading off from there to the west are the taxis to and from the airport. There’s also a grey line going up northwards where we caught a tram one morning. No doubt we missed lots of things! But we enjoyed what we saw.